Would you rather save on the amount of scrap or the amount of time spent cutting? It’s a difficult trade-off. What would you say if you could do both? Nesting involves positioning your parts to be cut in such a way that maximizes the amount of material that ultimately becomes a part. In many cases it enables common line cutting where parts shares a cut line by arranging parts, so that they have a common edge. For example, say you want to cut out four squares – Figure 1. Instead of cutting them individually and making 16 individual cuts, you can make 6 cuts – Figure 2. In this example, nesting has reduced the number of cuts by 63%. (NOTE: 2 cuts will be double the length of the other cuts). Nesting also enables higher product yield from the same amount of starting material. It’s not uncommon to increase the product yield 40% while simultaneously decreasing cut time. Nesting can be a tremendous time and material saver if done correctly and carefully. However, if a cut line fails, you lose not one part but two. So ensure your cutting parameters are sound before cutting. Employ lead-in and lead-out cuts to ensure quality cuts and reduce scrap . To cut a lead-in, start the cut slightly outside the edge of the object and lead the laser head into the cut line. The same technique at the end of the job could be used to finish the cut by using a “lead-out”. The laser would cut the part and then continue into the scrap part to finish the cut. Figure 3 illustrates this method. In other words, a lead-in allows the laser to enter the cut line and ensure that you’re into the material and cutting, while a lead-out allows the laser to exit the cut line and move onto the next part. However, lead-ins/lead-outs actually add time to any given part’s cut time. 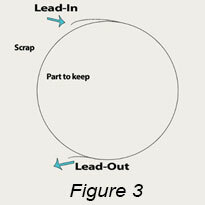 Lead-ins/lead-outs add about half a second of cut time per part, due to the incremental increase in linear cutting inches. However, factor in an entire project and lead-ins and lead-outs save you time since they ensure the laser is cutting the material BEFORE cutting the part you want to keep. This, in turn, reduces the need to scrap material due to poor cuts. Combine lead-ins/lead-outs with effective nesting to increase productivity while mitigating the risk of making cuts that don’t you’re your specifications. We’ve all received packages with “assembly required” written in the fine print. We tear open the box and see the component parts must be “popped” out of a sheet of parts. The process of creating the “pop-out” parts is called “tabbing”. The tabbing process leaves parts minimally attached to the original material via tabs or bridges. Tabbing can be great time saver, especially for thin materials, because it keeps your parts attached to the skeleton so you don’t need to pick up hundreds parts after cutting. Tabbing also reduces risk of damaging material since small cut parts can inadvertently blow off the table getting a scratch, ding or bend as they scrape across other parts or fall to the floor. Moreover, finish cuts with a clean, tabbed skeleton preemptively sidesteps the need to polish the material before carrying on with your project. Efficiency and productivity is essential when cutting. The next time you go to cut, try these methods and see how much time and scrap you can reduce from your work day. Have more time or material saving cutting tips or some thoughts about these? Join the conversation and leave your comment below. Vytek has solved thousands of unique application challenges over its 26 year history of manufacturing CO2 and Fiber laser cutting, marking and engraving machines. Call us to discuss yours: 978-342-9800. Good informative post. Thanks for sharing. I agree, choosing between time and material is a challenging question. Usually when cutting simple symmetric shapes like squares saving the material is quite easily done. More problems arise when we have something more complex, like circles or ovals in question. I like that you said that efficiency and productivity is essential when cutting. If I was going to cut metal, I would want to make sure I had all of the safety hazards dealt with. It might be a good idea to ask a professional for help. When laser cutting anything, it is always a good thing to learn how to minimize scrap, cut down on time and potentially increase production. Who knew the way you cut could increase production outcome and save time and money. Good info on here. Cutting laser cutting time and minimize scrap is always a plus. Especially when you have an extra large order. Nesting is a technique I prefer when cutting. “Tabbing”….so that’s what it’s called. And yes, have gotten many products with that. Good to know what it’s present for. Informative post guys. Great post here. And it does seem to make sense that nesting would cut time out of the laser cutting and increase production. And to minimize scrap is always a good thing. As the saying goes….”waste not, want not”. I appreciate your helpful images and diagrams. This makes it much easier for me to understand what you are describing. Tabbing is something that I have never heard of, but it sounds like this would be a great way to save time. Do you have a preference out of these three methods? Thank you! Hi! Thank you Brooke for your question. We find that nesting and common line cutting is really the most effective way to save material but tabbing is most useful for time management. These laser cutting methods seem like they could be useful for increasing efficiency. I like the idea of tabbing. It’s good to know that this method can help to reduce damaging materials and finish cuts with a clean skeleton. I can see how using “pop-out” parts could make laser cutting materials easier. Thanks for posting this! I was very pleased to search out this web site. I wish to thank you for your energy and time for this particular marvelous post. I’m undoubtedly enjoying every last section of this particular blog post and so I have got this unique webpage book-marked to get coming new article content. I thought the information for nesting when laser cutting is very helpful to know. It seems like making the most of the material that you use by cutting it a certain way would be tricky. It’s good to know that nesting can be used to enable higher product yield from the material they’re given. There is an option in the LaserWorx software that will next the pieces. This is extremely helpful when cutting parts. I have never seen laser cutting before, but I think it would be pretty cool to work with a laser cutter. I like the different types of cuts and ways to cut things without ruining the kept part. It must take a lot of skill to master how to cut precise measurements and everything. I’ve never tried nesting when cutting. I can see how trying this method can quickly increase the product yield! Cutting takes so much time, I ‘d rather get this step out of the way quickly. I’m going to try this method of cutting for my next project, thank you. We love ur blog very much! We think we will visit your site again.